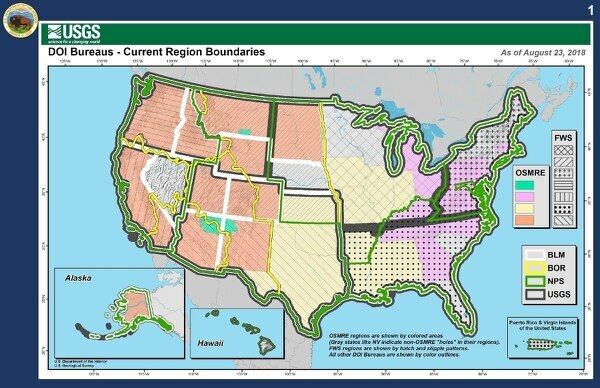 The Department of Interior finalized its map of 12 regional boundaries intended to divide the country as part of the agency’s reorganization and increased efficiency efforts, according to an Aug. 29 email obtained by Federal Times. The plan would assign efforts made by Department of Interior bureaus — such as the National Park Service and U.S. Fish and Wildlife Service — into regions determined by watersheds, wildlife corridors, trail systems and state boundaries to better coordinate agency efforts on a local scale. 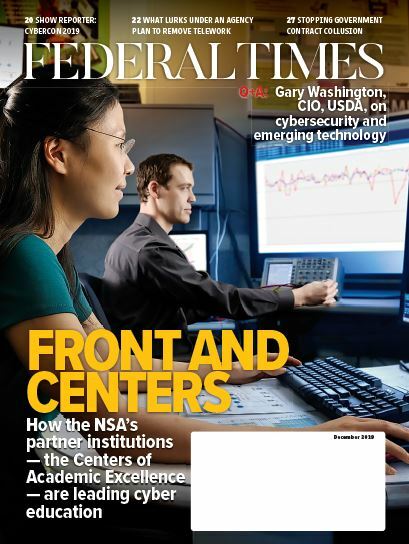 The new boundaries stem from a March 2017 executive order calling for federal agencies to submit plans for reorganization to the director of the Office of Management and Budget, many of which went into the development of the June 2018 reorganization plan. The Office of Management and Budget stated in June 2017 that it had received over 100,000 public comments on its agency reorganization efforts, but a FOIA request of those comments returned zero records. Interior submitted its reorganization proposal in September 2017, a component of which was to establish 12 regions for agency operations, according to the department website. Currently, the agency’s eight bureaus operate within 49 regions, and each bureau has its own regional boundaries. “In the coming weeks, we will take actions to align DOI into the 12 unified regional boundaries. 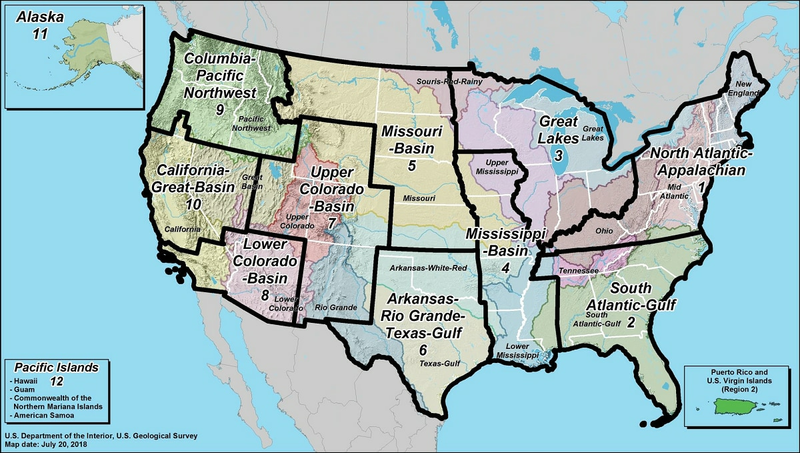 Bureau regional boundaries will transition from their current regional structures to participate in the new twelve unified regional boundaries,” wrote Interior Deputy Director of External Affairs Tim Williams wrote in the email obtained by Federal Times. According to the email, the finalized boundaries also come with new leadership responsibilities at each of the agency’s bureaus in each region. Some Senior Executive Service employees from the bureaus in each region will be assigned to regional leadership teams led by a regional facilitator, who will organize regional activities in collaborative conservation, recreation, permitting, acquisition, human resource management and information technology management. Each of those six areas will then have an individual team of key personnel determined by the regional facilitator to work on tasks and deliverables for those areas. The facilitator and their team will also develop the means of selecting and establishing a rotation process for an interior regional director from amongst existing SES leaders, who will have duties both specific to the needs of their own region and universal across regions. These IRDs will also address conflict between agency bureaus. “The various bureaus at the dDepartment oversee a broad range of resources and assets, often close or overlapping, many times with conflicting missions. Navigating this complex environment can be unduly difficult and time-consuming for all stakeholders. One goal of the reorganization is to create mechanisms within the department to streamline communications and decision-making,” a FAQ page on Interior’s website said. Eleven former Interior Department officials with decades of experience in both Washington and in local offices say the agency already has a well-established system for decentralized decision-making. Interior staff received a letter Aug. 29 updating them on the changes. SES staff that contributed directly to the development of the reorganization also received a second letter from agency leadership. According to the FAQ page, no employees will be forced to move as part of the reorganization and there are no plans to run a reduction in workforce. Bureau headquarters may, however, be moved. “The secretary is excited to be moving forward with the department’s reorganization plan, which goes along with President Trump’s goal to modernize and reform the entire executive branch,” an Interior spokesperson told Federal Times. The spokesperson did not confirm what the timeline for those decisions would look like. Why is OPM so slow to address ‘high-risk’ issues?